Posts Tagged "Bald Head Fantasies"
Home » Posts Tagged "Bald Head Fantasies"
Introducing the extraordinary work of Jerry Mylnchuck, makeup and hair artist like no other. He was obsessed making beautiful girls bald for one night through the use of makeup. 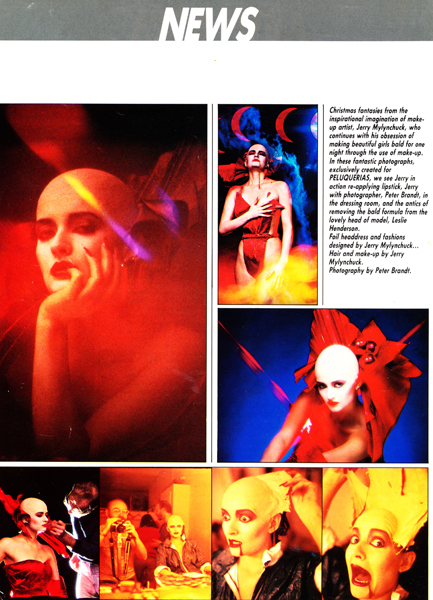 In 1983, we photographed these bald head fantasies with foil headdress and fashions designed by Jerry, exclusively for Peluquerias Magazine. You can see Jerry at work bottom left applying lipstick and Peter Brandt, the photographer, in action center bottom with Jerry in the background. The photos bottom right show the antics while removing the bald formula after the shoot.